I had the opportunity to teach Sunday school last week which gave me the opportunity to study and pray about the Family A Proclamation to the World. And I just have to say that I have a testimony of it. 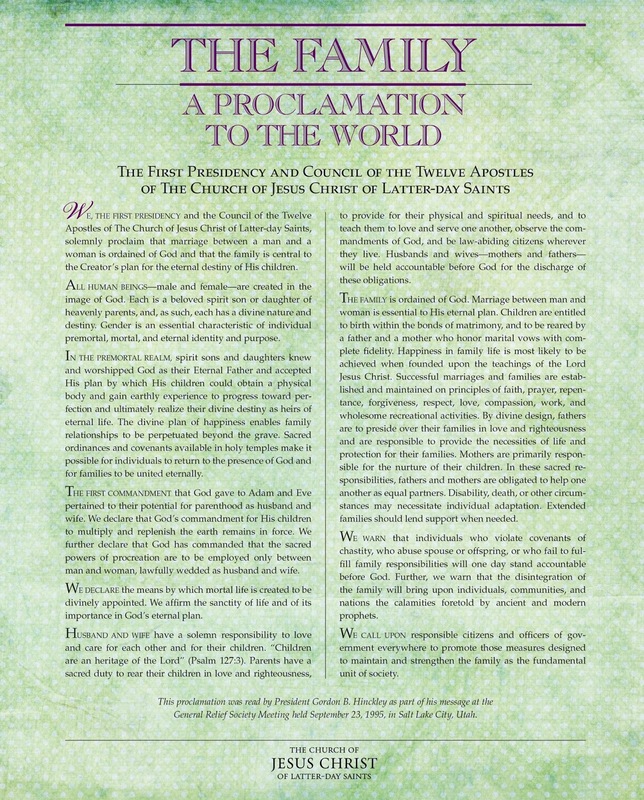 For those of you who don’t know, the Family: A Proclamation the the World was read by President Gordon B. Hinckley as part of his message at the General Relief Society Meeting held on September 23rd, 1995. With the recent events in the Supreme Court, I’ve had to dig deeper and really find out for myself what I believe. Do I believe that this document written the year before I was born still stands as the standard set by God today? If I do believe it, what should I do about it? What about my friends and family that believe differently than me? I believe the words the brethren spoke to be true and I have seen the effects of it’s teachings. I believe the family is the most sacred unit on this earth and that everyone deserves a chance to have a loving home. I do believe in kindness and acceptance of everybody’s opinions and choices even if they differ from my own and I respect those that stand up for them. To all my friends and family out there with differing opinions, I must say that I really do love you all more than you will ever know, many of my very closest friends have expressed differing opinions from me. That’s life and I still hold each of you to the highest respect; that’s why I call you my friends, however I do believe that those who post their opinion should allow others to do the same even if they are different. And that while all deserve to be equal, that includes an equal opportunity to have a freedom of religion. I believe in love, and I believe in God, and I believe in an eternal perspective. This is what I believe. I know the brethren had it right in 1995, and I know they have it right now. In fact, I know that it doesn’t matter weather they have it right or not because it is essentially God’s law and not anybody on earths place to decide. I know that those words are very true. When we look at God’s plan with an eternal perspective we see the reasoning behind his commandments. God’s work and his glory is to bring to pass immortality and eternal life of everyone that will follow him. Immortality means living forever; eternal life means living forever in the presence of God AND our families. Families are central to God’s plan of happiness. Living forever with our families is only possible through the sealing power that comes from righteous living and through the ordinances and blessings that come from a temple marriage. Without it there is no way we can receive eternal life. This being said I do believe that the world should be governed with love. We all have people that are close to us that experience same-gender attraction. Each of those people are great in the eyes of God and I don’t believe God would ever condone the act of bullying, name calling, or being mean to any of his children. Jesus said love everyone. He said to love your neighbor as yourself. And in the words of every “Gay Pride” activist; #LoveWins. We should love everyone and treat everyone with respect. There is no room for us to be mean. We are all God’s children and we should treat each other that way. At the same time we should stand up for what we believe in. Even if the task seems daunting and that we seem to be out-numbered. All I can think about is the story of Abinadi teaching King Noah and his priests. Noah was a wicked ruler that did not obey God’s commandments. He and his priests taught people to sin. Abinadi was a prophet of God that was sent to King Noah. Abinadi was teaching of the wickedness of King Noah and was teaching that all people needed to repent and follow Christ. When King Noah heard the words of Abinadi he was angry as are most people when they are told they are doing something wrong. Abinadi was brought to the palace by King Noah’s guards so that he could be killed. King Noah and his priests interrogated Abinadi in what I imagine to be one very terrifying encounter. Most people feel their heart pound out of their chest and sweat form on their palms when they bear testimony of what they believe in front of a congregation of people with the same beliefs that they call neighbors and friends. Can you imagine standing before someone with the power to have you killed and bearing your testimony? Abinadi was firm in his testimony and he answered all of their questions. God helped Abinadi as he bore truth of God’s words. As will he help all of us in times of need. King Noah was angry with the words of Abinadi and refused to believe his words. As did all but one of his priests. The only priest that believed him was named Alma (remember him?) Alma tried to stand up to King Noah, but was thrown out of the palace. Abinadi was brought back to the King Noah after three days in prison and told that if he didn’t take back what he said he would be killed. Abinadi knew that needed to stand up for his beliefs and he did. Abinadi was killed because of what he believed. While we may not be asked to die for our religion today, we are asked to live for it. Do we have the conviction enough that we can stand up to modern day “King Noahs” and fight for our religion? What I also love about this story is the fact that Abinadi probably didn’t know that Alma had been converted by his words. He defiantly didn’t know about all the people that would become followers of Christ because of Alma. Abinadi probably thought as he was going to be killed that he wasn’t making even the slightest difference. But in reality the fact that he had stood up for his beliefs brought one soul to the truth, which would in turn bless generations to come. You may not realize the effect you can have on the world by you standing up for your beliefs. But I promise you that you do make a difference. May we all be like Abinadi and have courage to stand up for eternal families and for our religion. May we know that God is bigger than anything else and that he is in charge. May we not fear man more than God. While we stand up for our beliefs may we have the courage and ability to love everyone and to remember that everybody we come in contact with is a child of God and that he loves each of his children. May we bring peace to this debate and may we love God forever. 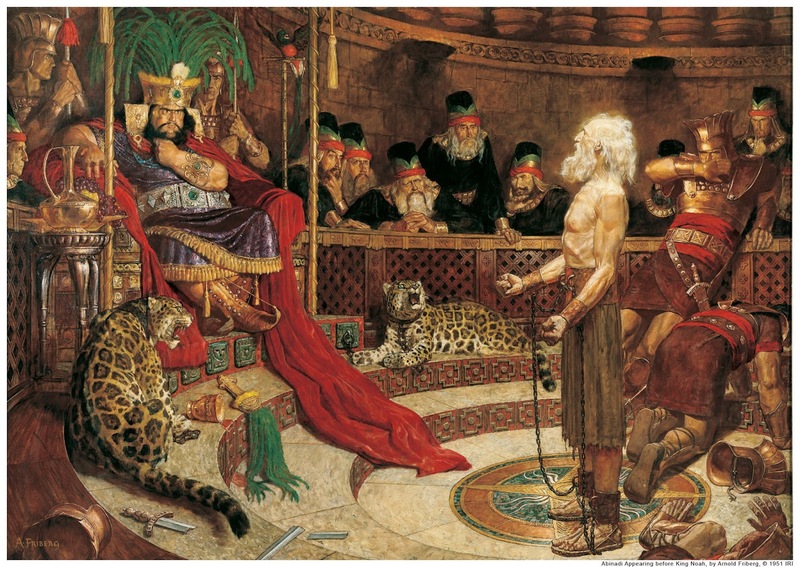 I just want to end this post by saying that I have a testimony of the Book of Mormon (which this story about Abinadi and King Noah is found in.) I know without a doubt that it is true. I know it was indeed translated by Joseph Smith and that Joseph Smith was a true prophet and that he really did restore God’s church on the earth. I know that Gordon B. Hinckley was a true prophet before he passed away and that Thomas S. Monson is the true prophet on the earth today and that the words that he, and the quorum of the 12 apostles do speak for God. I believe in their words and I believe in the hope and happiness that can come from following their words. p.s. I leave for Orlando in T-87 days! Not that I’m counting. But Oh my goodness I’m so excited to serve a mission! p.s.s. For those of you that are interested you can read the actual story of Abinadi in Mosiah Chapters 11-14. You can also watch this cheesy video about it!